Ross Petty’s annual holiday pantomime is an important tradition to keep alive in Toronto. There’s a depressing dearth of smartly produced kid-friendly theatre in this city and, at its best, Petty’s goofy fractured fairytale can be the clever centerpiece of a kid’s cultural year. 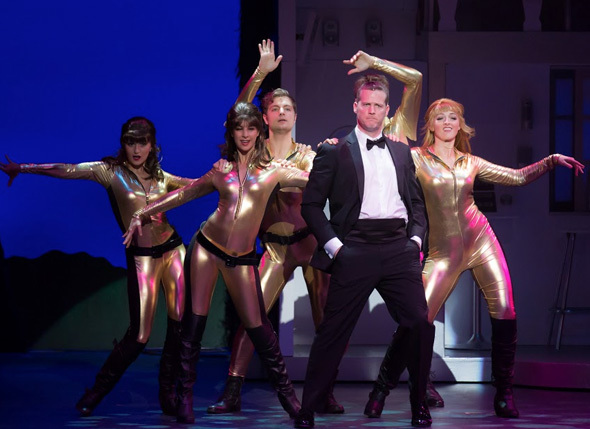 They get to dress up, go to one of the city’s oldest and prettiest venues- The Elgin Theatre- and watch a purely original, relentlessly upbeat show that makes use of songs and characters they already know. The pantomime is a rare place where kids can learn how to behave at the theatre without the pressure of being quiet and Not being able to scream “boo” at the villain (it’s very hard to resist the urge to boo a villain when, unlike at the panto, you’re not allowed to- you should have seen me try and hold my tongue during The Crucible!). 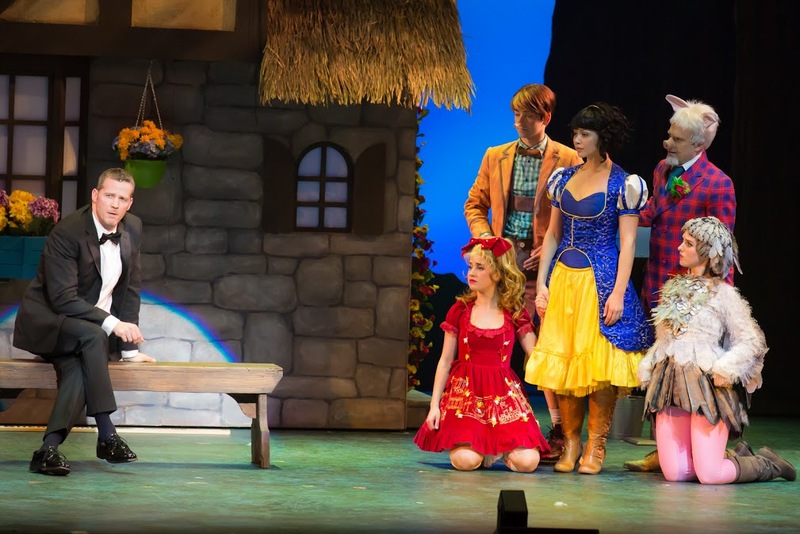 It’s a teaching tool, it’s a family tradition, it’s a laugh-riot and a trip down memory lane for young parents who remember going as kids themselves (at least it’s starting to be that now that the 10-year-olds from the panto’s inaugural year are solidly 27). It’s an important thing to keep alive and an important thing to keep affordable so, parents- buy tickets! (the seats were only about half occupied when I attended) and companies- sponsor a production! (the characters might even film an ad for you that will play during set changes in one of the cleverest product-integration gags ever devised to keep the budget up). Form the pantomime habit now and, while some years you may be more rewarded than others, you’ll be doing something good for Toronto this holiday season. For those of us who long ago developed the panto habit, Snow White won’t be remembered as a masterpiece of the Petty canon but it does have some moments of greatness. Casting-wise, there are no strokes of unadulterated genius on par with the casting of Bret “the hitman” Hart as Aladdin’s genie, but the assembled goofballs make for a pretty likable bunch. There’s the ever-adorable Eddie Glen leading the festivities (and peppering in incredibly welcome improv at Petty’s gracious expense) as Infestus the Fool. Boring but lovely Canadian Idol Melissa O’Neil returns as insert-princess-name-here (she was “Bella” last time, now she’s “Snowy”) and David Cotton is handsome-as-the-only-requirement as Prince Charming stand-in Jack. Petty himself plays the villain as he always does, alternating between girlish caricature and the far funnier manish deadpan that makes particularly his drag characters somewhat of a trademark. Most of the rest of the main cast is rounded out by over-reaching gag characters like Ham- an anthropomorphized pig who is unfunnily supposed to be Don Cherry- and overbearing but fun re-imaginings like Bryn McAuley’s Red Riding Hood via vapid teenage girl. My favourite characters were Snow White’s scavenger sidekicks who quippily support her efforts and dance backup to her big solo (Katy Perry’s “Firework”, obviously). Matt Alfano was my favourite of the bunch- a standout dancer who did the most with his small role as a raccoon. That’s right, he played a rascal raccoon who could not only dance his way around a good “Firework” but also an odd “What Makes You Beautiful” or two. Only at the panto. Also “only at the panto”… Shakespearean leading man Graham Abbey throwing himself around the stage as an ageing James Bond– this year’s chosen play on the “7” in the fairy tale’s original title. Abbey is smooth and classy and all the things a proper Bond is (here’s looking at you, Brosnan; NOT at you, Craig) but he’s also got what every successful pantomime star has in spades- the ability to laugh at himself. He’s not quite old enough for the body-falling-apart gags (not to mention the *not-so-shocking spoiler alert* plot twist involving the unlikely chronology of him being Jack’s father) but he’s game for them anyway and the only thing that tops his intentional physical comedy is the absurd look on his face when he’s forced to join in a “Gangnam Style” dance party (I don’t imagine most Henry Vs ever picture themselves doing such a thing). My favourite part of the whole show was- as it often is- the part where the cast pulls some kids up on stage to participate in the story. McAuley put in a valiant effort for about 30 seconds before handing the three kids selected at my performance over to Abbey for instructions. These kids were gems of comic potential and their systematic refusal to do any of the tasks Abbey’s Bond put forward led to my mother and I literally crying with laughter. As he introduced himself to the kids and the kids to the audience (including the littlest one who almost immediately lost interest and started waving at the pig, and someone aptly named “Oliver, not Ollie”), Abbey warned the audience to “bear with us, the script gets a little thin around this part”. And thank god it does because watching the actors improvise and struggle to guide incredibly young kids through a caper involving stealing Queen Farfrompoopin’s spellbook is Hilarious. At one point, having had his every tactic shot down by savvy Oliver-not-Ollie, Abbey collapsed on the floor laughing. By the time they found their way back to the script, the show was already more than worth the price of admission. Actually, all of this year’s best panto moments were when the script got “a little thin”, because the talent was all on stage and not necessarily on the page. When Glen was able to make Petty laugh so hard at himself that he literally lost his place in the script, whenever something went wrong (or a kid got Ollie-level unexpectedly amusing) and an actor (presumably all cast because they’re funny and clever and nice enough to deal with kids on stage) had to creatively navigate their way back into the story, when the audience took the welcome rowdiness to a level that just demands to be answered (Petty almost always engages, even throwing out a “good to have you in the audience, Rob” after a Ford joke landed with an obstinate guffaw)- those were all the best parts. In the past, some of the panto writers have been pretty clever, managing to craft something that’s fun on paper as well in execution, but that’s just not the case this year (this script is actually one of the worst I’ve seen at the panto- especially after last year’s pretty clever one. It’s forced, derivative, weak on story and generally just too Rick Miller-y). Last year’s was a little sharper, a little more objectively well executed (and had Kyle Blair as the scarecrow!) , but this year’s pantomime is still fun because it’s Ross Petty’s Pantomime and they’re Always fun because the folks who make’em are having fun. At Tarragon: The Real World?